This is one of those books that I consider to be a ‘bathroom reader.’ It is filled with sometimes interesting little facts, and in this particular book it is couched under the idea that these are things that perhaps can be done but most people will not do them because of a variety of difficulties. A few times (not too often) I did think to myself, “And why does he think I will never do this? I may actually do this.” But of course this isn’t really a book about things you will never do, it is a book about things that are difficult to accomplish and explain (very briefly) the sort of preparation that one needs to accomplish these sorts of goals. As I said, this is a bathroom reader. There are 100 interesting/difficult/challenging actions here in only 256 pages, which is also full of photos for each ‘thing,’ so nothing gets too in-depth and each is pretty easy to read. But beyond a bit of trivia, couched in a slightly different format, there really just isn’t much to this book. This is precisely the sort of book I would pick up in a book store, flip through the pages, perhaps mutter, “Hmmm. Ah.” and then put down again, forgetting all about it. It didn’t even offer me much that was new to me. If there was a ‘thing’ that I would never do that I was not already familiar with, then I typically found it something that was not at all interesting to me. The other items I felt I already had a better understanding for than what was presented. Looking for a good book? 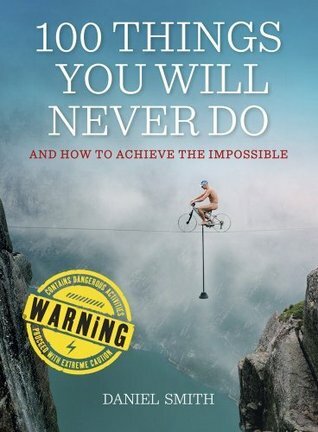 100 Things You Will Never Do, by Daniel Smith, is a trivia book of interesting things that humans have done but most of us will never attempt, and reading about them here is only slightly interesting.